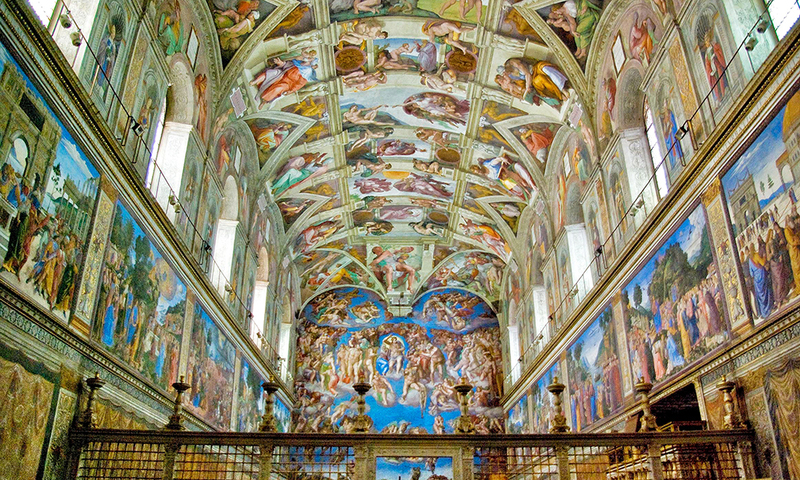 “Without having seen the Sistine Chapel one can form no appreciable idea of what man is capable of”. The Sistine Chapel was consecrated on August 15th, 1483 to honor the Assumption of the Blessed Virgin Mary. Although adjacent to St. Peter’s Basilica, the Sistine Chapel is not part of the church. 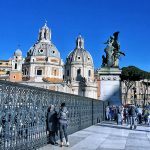 On the contrary it’s part of the apostolic palace and the only way for visitors to access the building is through the Vatican Museums. Today, the Sistine Chapel is still a sacred place, preferred location of the most important masses and ceremonies such as the Election of the Pope by the Conclave. When in 1508 Pope Julius II (also known as Giulio della Rovere) addressed Michelangelo to paint the Sistine Chapel, the room was already beautifully decorated. The name Sistine Chapel, (not Sixteen, neither Sixteenth Chapel) comes from Pope Sisto IV, who in 1474 was the first one to promote renovation works of the old, deteriorated Chapel Magna. From the outside the Sistine Chapel is similar to a fortified castle. It features 4 floors with tall, narrow windows. 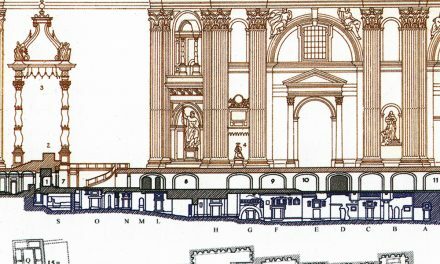 The actual Sistine Chapel has a pretty regular, rectangular plan with a central nave. It measures 40,23 meters in length and 13,41 meters in width. The same measures the Bible attributes to the Temple of Solomon in Jerusalem. On the inside, the Sistine Chapel was decorated with frescoes, carried out by Botticelli, Perugino, Ghirlandaio and other famous painter. Until Michelangelo, the famous vault was a blue starred sky, carried out by Piermatteo D’Amelia. Julius II: a Hot-Tempered Pope! Chronicles of the time describe Pope Julius II, nephew of Pope Sisto IV, as a man pervaded by a great vitality and uncontainable energy. 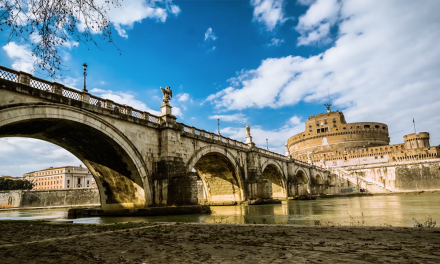 The peculiar traits of his personality became pretty clear not only in politics, but also in the arduous task of building St. Peter’s Basilica. Unhappy with D’Amelia’s starred sky, in 1483 the Pope addressed the young Michelangelo Buonarroti for a brand-new vault. 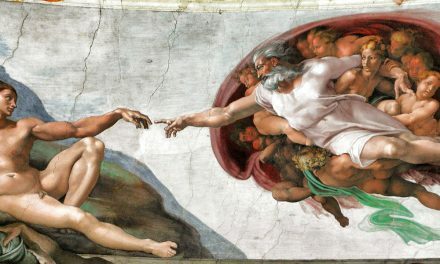 However, at first Michelangelo refused, stating that, since he was a sculptor, he was not comfortable with the fresco technique which he had never experimented before. Julius’ persistence and determination allowed him to persuade Michelangelo to accept. “You’ll do a great job,” said Julius. Michelangelo eventually agreed – it’s pretty hard to say “NO” to a Pope – and started painting the vault and the lunette at the top of the wall. 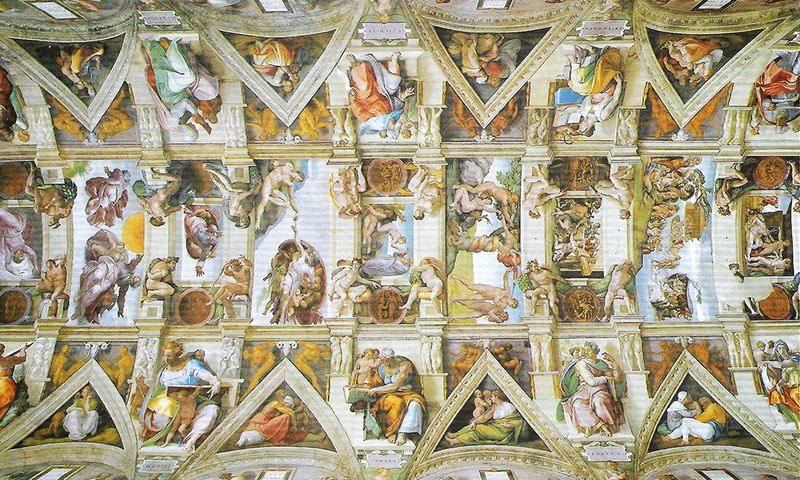 How did Michelangelo reach and paint the Ceiling? 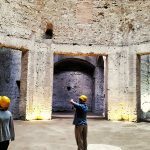 Works lasted 4 long years from 1508 to 1512. These were certainly tough years for the artist who put his health in danger to complete the work. The major difficulty he had to face was figuring out how to reach the tall ceiling. We know what some of you may be thinking right now! “He must have had a very long paint”. The answer is “No way!” The young Michelangelo built for himself a wood scaffolding, composed by several steps. This was the only solution, but just think about the implications for his health. The paint drizzling in his eyes almost caused him blindness. 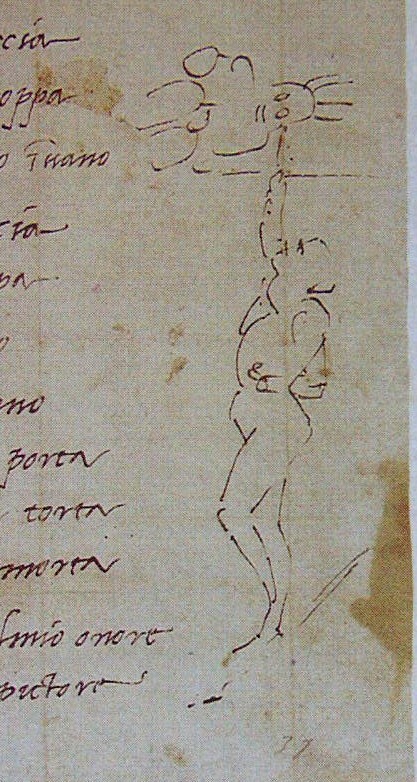 After the first drawings, Michelangelo figured it was too hard to paint all day standing for hours with his arm upward. Due to the posture, we know for sure he also had cervical issues. 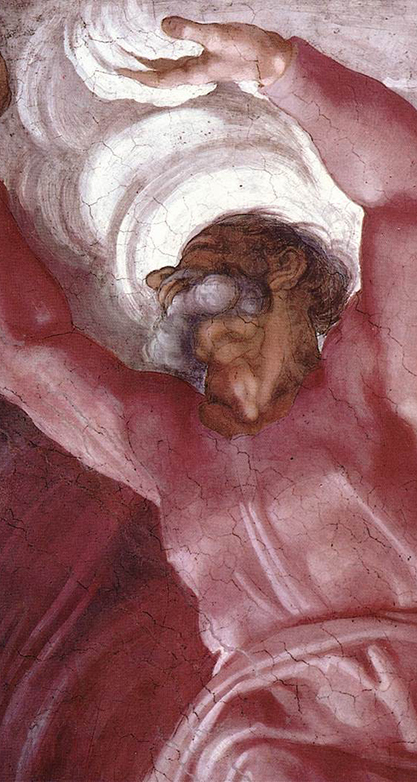 The image of God in the act of Creation reflects Michelangelo himself in the act of creating the ceiling. Michelangelo’s illustration to his poem shows him painting God. Soon Michelangelo realized it was time to speed things up if he wanted to free himself from the “uncomfortable” work! He abandoned the freehand drawing and organized preparatory cartoons on which he sketched bodies and faces. By impressing the outlines of the subjects on the plaster, Michelangelo was able to complete and paint entire panels in one day, from sunrise to sunset. The cartoons were transferred on the ceiling using the Pouncing, an art technique used for transferring an image from one surface to another. 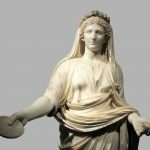 The paper was pierced along the outlines of the subjects, then transferred to the plaster and gently spread with carbon powder leaving traces of the design. To put it simply, it is not that different from stencils today. As if things weren’t already enough complicated for Michelangelo, the difficult personality of Julius II for sure didn’t help. The Pope was able to persuade Michelangelo to pay in advance for the materials. Moreover there were some disagreements above the subject of the frescoes. It looks like Michelangelo was reluctant to paint the subject the Pope had commissioned him. According to the artist the 12 Apostles were going to look “cheap” compared to the 700 squared meters of ceiling. Hence, he decided for a different subject. Notwithstanding the several difficulties and troubles, on November 1st 1512 Michelangelo completed the frescoes on the Vault of the Sistine Chapel. The masterpiece was shown to the public that was simply stunned by the work. 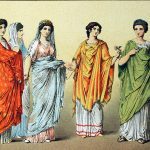 Each one of the panels showed a new conception of beauty and color. The dynamisms of the figure makes them look like sculptures. Even today it’s hard to believe they are not 3D images. In the middle there are nine panels featuring stories from the Book of Genesis. Among them stands the famous “Creation of Adam” (see the picture above). On the sides you can spot imposing, athletic naked youths called Ignudi painted at support of other scenes from the Books of Kings. You can also admire the Seven Prophets of Israel and the Sybils. 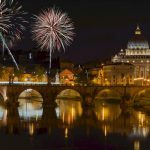 30 years later another Pope Clement VII called Michelangelo again! This time the Pope asked the artist to fresco the wall above the main altar, that showed paintings from the 1400 by Perugino. In 1539, after 5 years of work, Michelangelo completed the “Last Judgement”. The whole scene develops around the image of Jesus Christ, set in an abstract dimension, out of time, out of space. The other figures lay on clouds on a bright blue background. Absolute masterpiece of art, Michelangelo’s Last Judgment gave rise to many criticisms due to the presence of many naked figures that were considered obscene. In 1564 the Pope asked Daniele Volterra to cover the “outrageous images”. The painter actually added pants to the figures. Some of these “additions” have been partially removed during last renovation works of the Sistine Chapel. When you enter the Sistine Chapel from the Vatican Museums is like reading a book upside down! So, once inside go the end of the room and turn. Look at the wall on the opposite side, there you’ll see the “Last Judgement”. Don’t forget to look at the ceiling!